Here you can find all our latest press coverage. A selection of our recent appearances are below. If you’d like to sign up to our press release list you can do so by getting in touch. 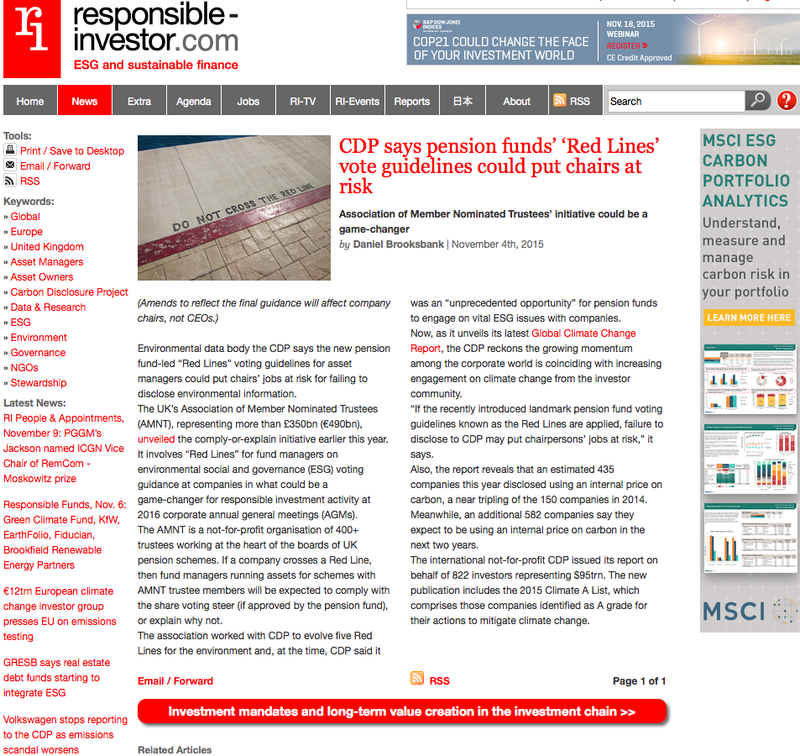 We have received recent coverage in the Financial Times where they have discussed the Red Line Voting programme developed by the AMNT which sets out standards around environmental, social and corporate governance issues, after a 2014 recommendation by the Law Commission. Association of Member Nominated Trustee’ initiative could be a game changer. In the months leading up to the 21st UN Climate Change Conference, policy makers, pension trustees and academic thought leaders have been active devising new ways of fostering private capital stewardship and “green investment”. Pension funds and other asset owners have historically had a limited capacity for detailed ESG proxy research on the companies in which they invest, and consequently asset managers receive varied guidelines for proxy voting. The sheer volume and complexity of holdings and companies made it an endless task. AMNT members overwhelmingly approve new governance policy approach. A trigger system that alerts fund managers about a company’s behaviour could empower trustees and make more responsible investing more accessible. Governance policy instructions for fund managers – backed by government – could be in the market by September. Hong Kong considers stewardship code; UK may see first lawsuit regarding fiduciary duty.